R2-KT was created by Albin Johnson, founder of the 501st Legion, master droid builder Jerry Greene and the R2 Builders Club, for Johnson’s daughter Katie (the ‘KT’ in the droid’s name is a tribute to her). In real life, R2-KT makes appearances at children's hospitals, Star Wars Celebration and charity events in the southeastern United States. In the Star Wars universe, the character had a cameo in the Star Wars: The Clone Wars film, and has been made an official part of the universe’s canon. 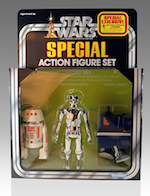 Gentle Giant Ltd. is excited to realize our own incarnation of this character with the R2-KT Maquette. 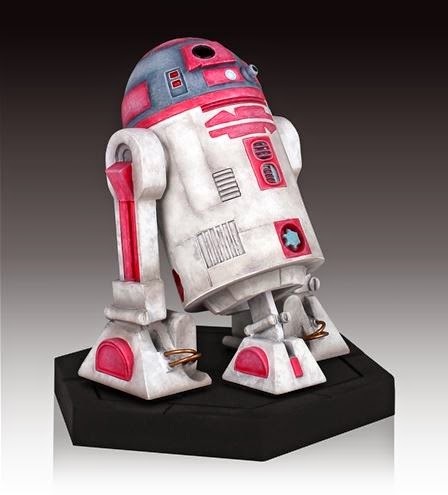 More importantly, we’re proud to announce that $10 from each R2-KT Maquette sold will go to the San Diego Chapter of the Make-A-Wish Foundation. 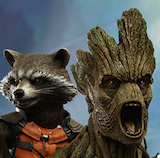 Digitally sculpted by the master artisans at Gentle Giant Ltd., the R2-KT maquette uses the top photo reference available for top-notch accuracy. Cold cast in high quality polystone and hand painted, each limited edition maquette comes individually numbered and includes a matching certificate of authenticity. Available at SDCC 2014. May the Force be with you. The SDCC exclusive Star Wars R2-KT maquette is now available for for pre-order at http://www.gentlegiantltd.com/product_p/pgm80428.htm for Premier Guild Members.